I am not sure if you remember me. You did my Competency Certificate and Firearm License Applications for me last year October. I am over the moon to inform you that they have both been approved and are on the way to my local police station despite our concerns regarding the suitability of the firearm. 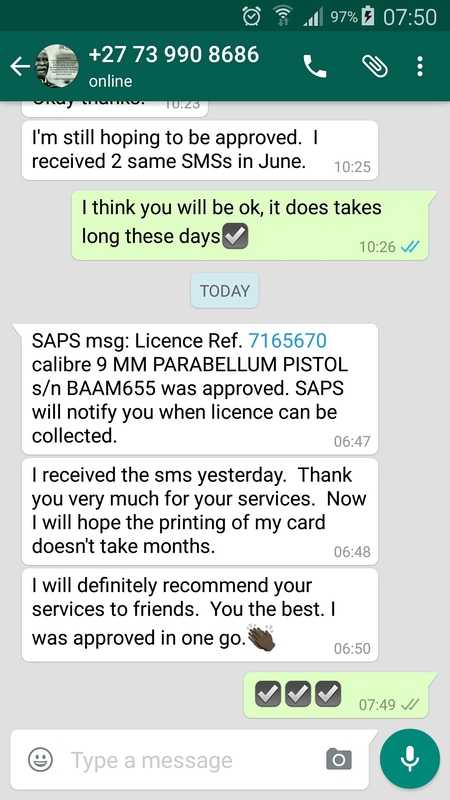 Thank you so much, you will definitely be hearing from me again for my next firearm and I will definitely be recommending you. My renewal for both license and competency were successful. Thank you very much for you professional service. 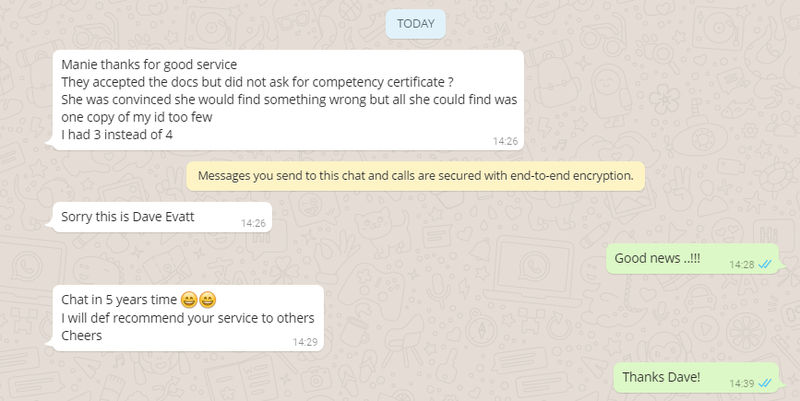 I am already sharing with friends your excellent service. Thank you once again. Things have been so hectic could not share the good news with you on time because of my busy schedule. Ek waardeer die spoedige terugvoering en die raad. Fantastiese diens! Baie dankie vir die. Dit lyk ongelooflik profesioneel. Ek dink rerig nie dit is die R800 werd nie jy kan jou prys maar opsit. Dit is werklik ongelooflik goed gedoen. Baie dankie vir die hulp en goeie diens. Ons waardeer dit. My aansoek is in. Dankie vir jou hulp – sal verseker weer van jou dienste gebruik maak. Ek het gister die eerste keer gaan skiet met my wapens. Wil net baie dankie se vir die motivation letters en al die hulp om die wapen lesensie te kry. Hallo Manie. 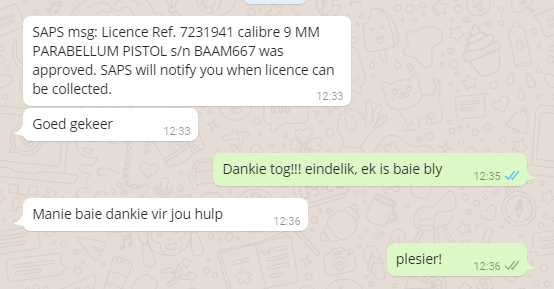 Baie dankie vir jou hulp met motiveering vir my 9mm FS beretta. Ek wil net se baie dankie vir die hulp met die 3 vuurwapens se lisensies. Al 3 is goed gekeur en ek kan my lisensie gaan haal. Ek wil net vir julle baie dankie se vir die aansoek wat julle vir my voorbery het. Ek het einde ten laaste my lisensie gekry. Daar was n probleem met die instansie se akrediteering by wie ek my bevoegdheid kursus gedoen het,wat toe n paar weke gevat het om uit te sorteer. Dit was n plesier om met julle te werk en sal julle beslis aanbeveel. Application submitted to Parkview police station today. No problems. I have submitted, my application for the renewal of my firearm licence and competency certificate today. Everything went smoothly and without any hassle what so ever. The forms were fully prepared and complete with, a very good motivation and stats. attached.This made it painless for the DFO and me which in turn made my day. and recommend you to my family, friends nd clients. Thanks very much – your pack was fantastic! Worth every cent. Your assistance and calm manner really made it very pleasant to deal with you. The submission went off without a hitch, and I have already received SMSes informing me that the process has started. The DFO was really pleased that I was prepared and it went very smoothly – a real change from the people ahead of me in the queue. To confirm it is R70 for a renewal of competency and R70 for the license renewal. Alles lyk in orde. Ek is beindruk met jou motivering wel gedaan. Ek sal jou laat weet as ek die aansoek by die polisie stasie ingegee het. hi manie and to follow up and thank you for the help! im still in china but just to thank you for doing the docs so quickly and sending to me and for being so accommodating. fortunately i managed to meet the right person at 07h45 on the monday and then left for the airport. so thank you again and hope it all works out. 10:10 AM (22 hours ago)to Firearm-Licens. I would also like to take the time to commend you in the motivation that you previously prepared on my behalf. It was clear, concise and very well put together. I had no doubt that it would be approved – The CFR agreed as well as I received confirmation of approval a few weeks ago. I have and will continue to recommend your services to anyone that I know that will be looking for a firearm license.